Tomorrow the Proteas will take to the Bull ring in a quest to level the ODI Series with England in the much anticipated and eagerly awaited Pink match. The Pink Day ODI is held annually in support of Pink Drive and is an opportunity for fans of the Castle Proteas to come together in support of a cause greater than themselves. Castle Lager, official sponsor to the Proteas, have jumped on board the outstanding initiative by launching the first ever #BraBrigade. 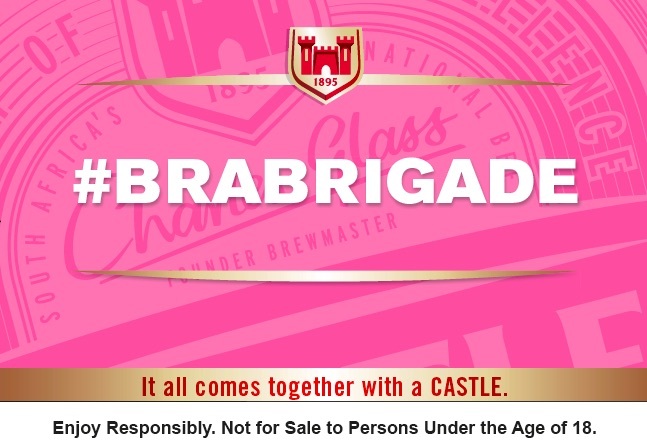 The #BraBrigade is a movement initiated by Castle Lager that lives across all social media platforms, which calls on all South African men to take a stand in support of the Pink Drive. Its aim is to provide them with the platform to join the conversation and encourage them to drive breast cancer awareness among the most important women in their lives. The movement will also be brought to life at the Pink Day ODI, as a literal #BraBrigade takes their seats to cheer on the Proteas. “Castle will once again be making a post-match donation to the wonderful Pink Day ODI initiative, but this year we wanted to go beyond this and really get behind the cause of beating breast cancer in a big way. We are calling on all South Africans to come together and join the #BraBrigade and show their support for the Pink Drive’s cause,” Commented South African Breweries’ Sponsorship Manager Errol Madlala. Castle Lager have enlisted members of the Proteas ODI squad, as well as South African cricket’s new unofficial fan club, AB’s Babies, as the first members of the #BraBrigade. Cricket South Africa’s Chief Executive Officer, Haroon Lorgat, is not at all surprised and is encouraged by Castle’s involvement in the day. “As a longstanding partner of Cricket South Africa, we are immensely pleased to have Castle Lager’s backing of such a worthy initiative and we are confident that their association with the Pink Day ODI will do a great deal in building awareness around the Pink Drive and their cause,” said Lorgat. As a part of the #BraBrigade campaign, Castle will be donating R2,50 for every Castle sold in the stadium. Castle will also be making a donation of R10,000 to the Pink Drive for every player catch taken during play at the match and R15,000 for every six caught in the crowd, plus a R5,000 award to the catcher. To show your support and be a part of the #BraBrigade movement both at home and live at the game, follow @CastleLagerSA and search #BraBrigade on Twitter. To learn more about breast cancer, please follow @ThePinkDrive on Twitter.